Zypper is the command line package manager for openSUSE, introduced in openSUSE 10.2 which uses the libzypp library. 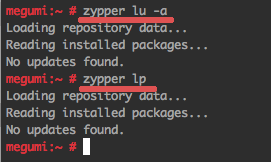 Zypper provides a command line interface to manage repositories, the software installation, packages, patches, verifying dependencies etc. Commands to manage openSUSE repositories. Add new repository, delete or edit the repository etc. Manage packages and install software. Install or remove packages, verify the integrity of packages etc. 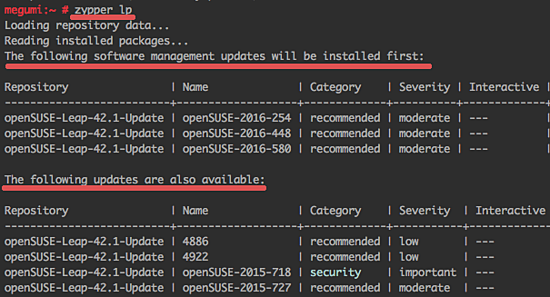 Update management for openSUSE. Update installed software, install patches for packages, upgrade the openSUSE distribution. The zypper query command is used to search for packages by name, show detailed info about packages, list available patches, etc. In this section, I will explain how to use the zypper command to manage openSUSE repositories. I will use the zypper command to add a new repository, remove a repository and get a list of all available repositories. We will add the packman repository to openSUSE leap. Packman is the largest external openSUSE repository, it provides packages for multimedia applications, libraries and many other useful packages that for your system. Option - to use zypper help to see the option. We can use the "mr" or "modifyrepo" command to alter the repository. There is an option to modify the repository, in this step I will just use the option to enable or disable the repository. In this chapter, I will show you how to search for software or packages with the zypper command. The package search is based on the name. The commands will show the details of the package, list available patches, and available updates. 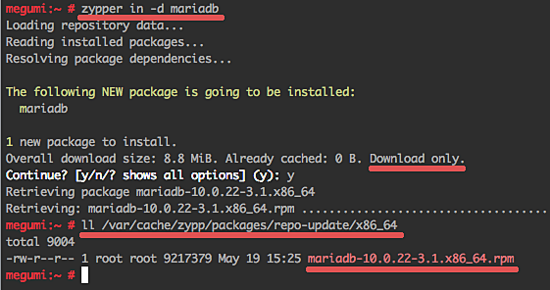 We want to search for a new package for "mariadb", then get detailed info's about it like size, version, architecture etc. Now you know all available details of the package that you want to install. Now I will show you how to manage software packages on openSUSE leap with the zypper command. We will install a new package, remove a package and clean packages. 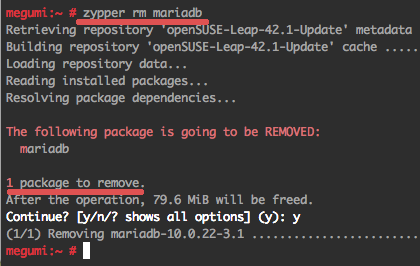 In the zypper queries section, we searched for MariaDB, now we will install that package. Type "y" to continue the installation. 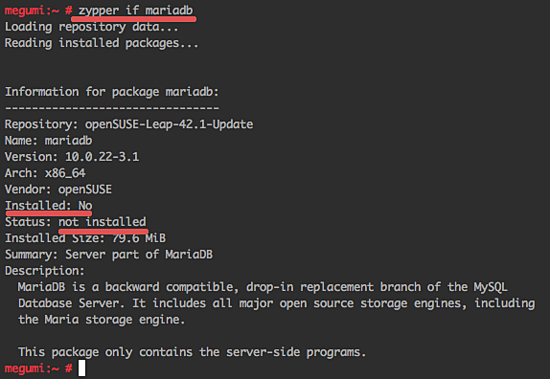 Now MariaDB is installed again. This time, we installed it from the previously downloaded rpm package with zypper command. It's an update for anyone using a stable release of openSUSE and wants to update their system with new patches through an online repository. By default, the patch update repository is enabled in the openSUSE, so we do not have to add a new repository. This method installs updates by downloading complete new packages. This is used for general Linux updates, and can be used for updating packages to newer versions from any repository on the system. there are 138 patches available, 42 of these patches are security related. The update process will ask for confirmation, type "y" and press enter to download and update all packages. Wait for the update process, it may take some time. all packages have been updated. The command "zypper patches" doesn't install patches, but prints a list of all possible patches. It has columns with status, importance, etc.